A child prodigy for anything and everything mechanical!! Rock’s trusty partner!! A 14 year old girl, and Rock’s girlfriend that he’s known since infancy. A genius at tinkering with machines, she is in charge of the piloting and maintenance for their flying ship, the Flutter. Moreover, she acts as an Operator for Rock, aiding him while he’s traversing the underground ruins. Roll’s grandfather is the legendary figure Barrel Caskett. When it comes to piloting, repairs, and all things mechanical, this girl puts adults to shame! 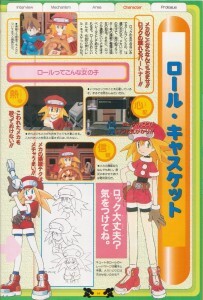 Adorable as ever, Roll’s trademark is her hat and gloves. She wouldn’t much be able to work with machines like she does without them, now would she? She’s always worried about Rock!! Roll always shows concern over Rock’s safety! At times she behaves almost like a protective big sister. She just can’t bear to leave broken machines lying around!! She loves machines as much as anyone, so they’re very important to her. When she sees a broken machine, she can’t help but to try and repair it. Her mechanical techniques are incredibly skillful!! She always has a way with machines that won’t be outdone. When you entrust in her, you’ll never have to worry about a thing. She can put together useful parts from broken equipment! With her prodigious mechanical know-how, she can craft broken machines into excellent accessories. She can even invent parts! She’s also adept at modifying weapons!! With her ingenious capabilities, she can do more than just build parts. She can also remodel weapons! She provides Rock with wireless support!! While Rock is exploring the ruins, she has the very important job of providing him with backup via radio. The Road to Creating Roll!! Roll is cute even without her hat! This bio notes various things like how much she really likes Rock. She and Tron are rivals in more ways than one! At this time, her jacket was still smaller, like a vest. She’s got her familiar short pants now, but also some unused goggles. They’ve also made a very grown-up version of Roll, but since she’s only supposed to be 14, the current Roll is the most appropriate don’t you think? With the gloves, the hat, and the jacket, it all came together charmingly! 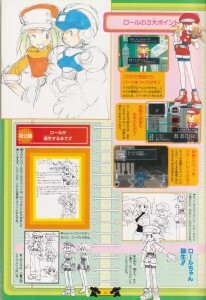 When it came to the Rockman DASH series, the character of Roll was completely re-imagined. Compared to her classic counterpart, she is in some ways both very different, and very much the same. Now a genius mechanic with tomboy style complete with untamed hair and positioned as a full-fledged love interest for Rock, she’s still strikingly familiar as the blond supportive female character rocking the red outfits, sometimes strict and often getting carried away in her work, but always displaying a gentle loving heart overall. Following this game, the original Roll even took a few cues from her, like using the communicator to act as Operator (basically another term for a Spotter or Navigator, remember) for Rockman and Forte in their titular final adventure on the Super Famicom. As you can see, Roll Caskett didn’t change too much at all from concept to final, same spiky hair and basic outfit with just minor changes for the most part. 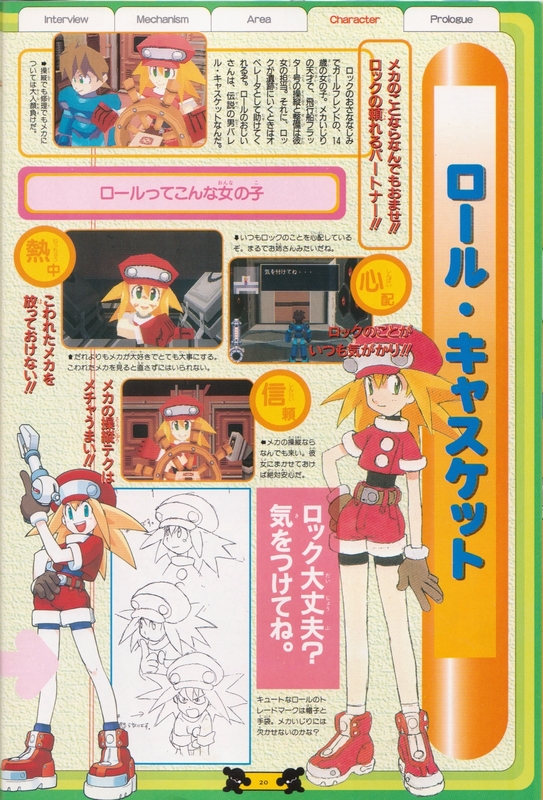 In addition to being a central feature in her design, Roll’s hat may even be the source of inspiration for her last name (from the French word casquette, meaning cap). Some of her fashion sense is thought to have been inspired from the character of Pazu from Castle in the Sky, particularly the early hat with the goggles. The large round buttons always remind me of Kalinka from Rockman 4, myself. Another interesting thing I thought was the image on page 21 of the grown-up Roll. You can spot Barrel in the background, apparently catching a nosebleed from looking at her, and commenting that she looks the spitting image of her grandmother. We have very little information about her, not even a name. Were we given any other idea what Roll’s grandmother did look like? There could be a clue in this official image from the long lost Rockman DASH Original Greeting Card Service page (via Archive.org). It appears to be Barrel in his younger days, sharing a romantic moment with a fair-haired lady. That could be Roll’s grandmother, although some disagree, saying it could also be Amelia (the Kattelox Mayor from the first game who knew Barrel as a professor from her school days). She does have Amelia’s taste in earrings. What do you think? 7 Comments to "Know Your Heroine: Roll Caskett"
I’ve seen both “Operator” and “Navigator” used throughout the Mega Man series, are these actually just different translations of the same Japanese phrase, or is there a subtle difference in both languages? A fine question! And RADIX is correct, it seems to simply be a matter of preference. If you’re interested in Japanese and your computer has Japanese character support, they’re usually written Operator “オペレーター”　Navigator “ナビゲーター”　and another one that’s rarely used but you still come across sometimes is Supporter “サポーター”. The English version of Legends adds the term Spotter to these. “Operator” is by far the most common; the early X series, Zero series, ZX series and DASH series all use it quite often. The term Navigator started being used around the Rockman Complete Works games’ Navi Modes and with Alia in X5. Since you were curious about a subtle difference in terms, it would probably be that Navigator is used more when the character tends to interrupt game play to give advice about stages. The later X series uses Navigator a lot, but characters like Alia and Nana are just as often referred to as Operators. I seem to recall X8 only using “Navigator” though. The only place they can’t be used interchangeably is with EXE, since their Operators and Net Navis are filling entirely separate roles. Man. I…really want to see the rest of Younger Barrell, surprisingly. From what it looks like he’s gone from having a scar on his eye to having half of his head replaced. He really must have been tough back in the day. XD And it’d be cool to see Roll’s grandmother, too. That’s one of those things I’d always wondered about from way back in ’98, but you don’t see a lot of people really address it. If that’s her in the picture, that would be awesome knowing Capcom actually might’ve had something in mind for Gramma Caskett. There is a picture from the DASH Official Gallery that may be younger Barrel. The Kobun in the corner says “He… he looks familiar…” and Barrel is saying “My younger days <3" Good to see he had normal eyes at some point! Also, a correction to what I said earlier about X8: going through some of the dialog yesterday as I was playing through again, they do use "Operator" once or twice in that game after all!